The legendary exploits of Henry Sinclair have grown to incur this unremarkable fourteenth century Orkney earl a reputation that has very little to do with his actual accomplishments. Beneath centuries of legend, mythology, and pseudo-history, the historically uninteresting Henry Sinclair has been supplanted with a character famed for his associations with the Knights Templar, the Holy Grail, a Freemason conspiracy, and a trans-Atlantic voyage. To understand the mysteries surrounding Henry Sinclair, Earl of Orkney, we must first examine the origins of his family. The St. Clairs trace their origins back to Rognvold "The Mighty," a ninth century Norse chief whose son, Rollo, made war with King Charles of France. The treaty they signed in 912 at St. Clair-sur-Epte, from which the family takes its name, made Rollo the 1st Duke of Normandy. William "the Seemly" St. Clair, descendant of Rollo and founder of the Scottish Sinclair clan, came to England with his first cousin, William the Conqueror, and fought alongside him at the Battle of Hastings in 1066. Two years later, he accompanied Margaret, a Saxon princess, from her refuge in the Hungarian royal court to Scotland, where she married King Malcolm III. On the journey, St. Margaret carried with her the Holy Rood, a relic of the True Cross. For these acts, William St. Clair was granted the Barony of Roslin in 1070. (The name derives from the combination of the Gaelic words ros, or rock, and lyn, or waterfall.) 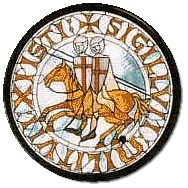 William's son and heir, Sir Henry St. Clair, 2nd Baron of Roslin, fought in the First Crusade. 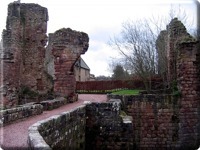 The Sinclair family fought with Robert the Bruce at Bannockburn, and Sir Henry, 7th Baron of Roslin, was one of the peers who signed his name to the Declaration of Arbroath in 1320. 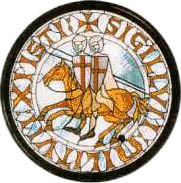 After Robert the Bruce died, Sir Henry's two sons, William and John, accompanied Sir James Douglas to carry the king's heart to Jerusalem to deposit it in the Church of the Holy Sepulchre. William, John, and Douglas all died in a fierce battle with the Moors at Teba in Spain in 1330, but the Moors were so impressed with the courage of the Scottish knights that they allowed the survivors to take their dead - and the king's heart - for burial back home. This is the family into which Henry Sinclair was born. 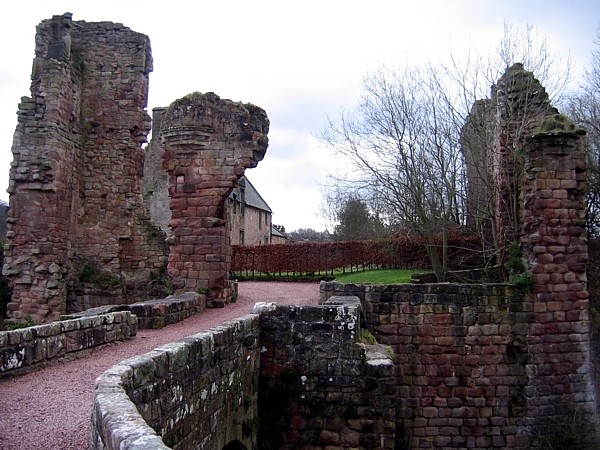 This much we know for certain: Henry Sinclair was born in Roslin Castle near Edinburgh around 1345. He was the son and heir of William Sinclair, 8th Baron of Roslin, and Isobel of Strathearn, daughter of Maol �sa, Earl of Orkney. Henry inherited the Barony of Roslin, along with a group of minor properties in Lothian, when his father died around 1358. After winning a succession dispute with two cousins at the death of Maol �sa, King Haakon VI of Norway invested and confirmed Henry as the Norwegian Earl of Orkney at a ceremony in Marstrand in 1379. 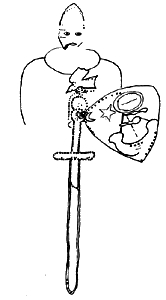 The Sinclair Diploma, written by Henry's grandson, states that the earl retired to Orkney in the later part of his life, where, in 1401, he was killed during an English invasion. His son, also named Henry, inherited the earldom but remained in Roslin all his life, never visiting once during his twenty-year reign. And this is where the record ends. Henry Sinclair's legend began with a single sixteenth century Venician document. The Zeno narrative, published anonymously in Venice in 1558, has been attributed to Nicolo Zeno, who wrote the manuscript in honour of his ancestors, the noted Italian navigators Nicolo and Antonio Zeno. The book was allegedly compiled from letters the navigators wrote during an Atlantic journey they made in the year 1380 to a relative living in Venice. 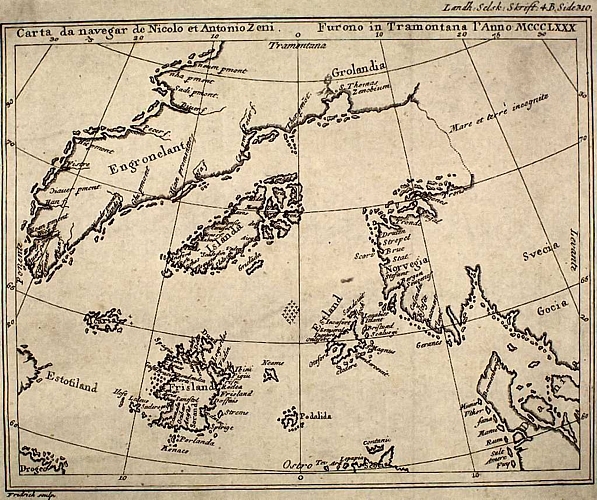 According to the narrative, Nicolo Zena was shipwrecked on an island called Frislanda, only to be rescued by a man named Prince Zichmni, "a great lord" of the isles Porlanda." "Zichmni," the narrative tells us, "had won a victory against the ruler of Frislanda, the king of Norway." Nicolo then invited his brother Antonio to join him in Frislanda, and the two spent fourteen years waging wars in small islands of the North Atlantic under the service of Zichmni. Nicolo died in Frislanda after returning from a five-year stay in a northern land. Soon after Nicolo's death, Zichmni learned that a group of fisherman from Frislanda who had been lost at sea twenty-five years ago had returned. The fisherman described their stay on unknown countries far to the west, Estotiland and Drogeo, populated with strange animals and cannibals. Intrigued by their tales, Zichmni began a voyage west, giving Antonio command of the fleet. The crew landed at a promontory called Trin on the southern tip of "Engrouelanda". Although Zichmni enjoyed the land's climate and soil, his crew found it inhospitable. So the sailors returned to Frislanda with Antonio, while Zichmi stayed at Trin to build a town and further explore the land. How does this travel narrative relate to Henry Sinclair, Earl of Orkney? It didn't until the 1780s, when travel writer John Reinhold Forster suggested that Zeno's elusive "Prince Zichmni" was actually the historical Henry Sinclair. Claiming that Zichmni was a corruption of the name Sinclair, Forster went on to conclude that Frislanda referred to Faray, a small island in Orkney. Citing Sinclair's victory of succession against the other claimants to the earldom of Orkney in 1379, Forster also suggested that that had been Zeno's point of reference for Zichmni's "victory against ... the king of Norway." Forster's theory that Zichmni and Sinclair were the same person went ignored for a century until Richard Henry Major, a geographer and map librarian for the British Museum, revisited the Zeno narrative in 1873. 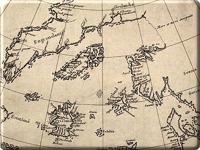 He revised the text and the supposedly authentic map that accompanied the original manuscript to set out the story of how Henry Sinclair and the Zeno brothers explored the North American coast. Although later cartographers thoroughly dismantled the historical accuracy of Major's work, the Sinclair legend had already taken hold of the world's imagination. Dan Brown's 2003 bestselling thriller, The Da Vinci Code, ensured that this piece of Scottish lore would continue to thrill audiences into the twenty-first century by featuring various strains of Sinclair legend into his book's plotline. 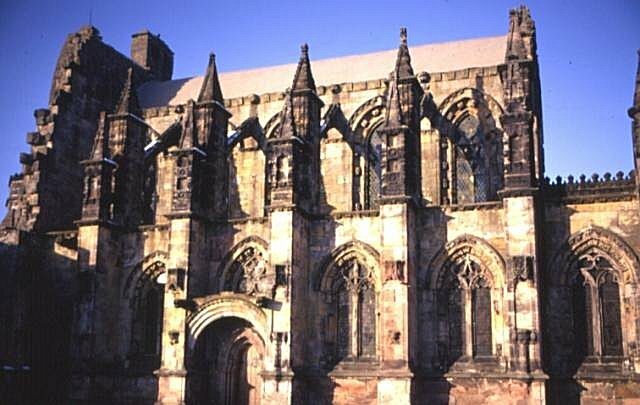 Rosslyn Chapel, which features prominently in The Da Vinci Code, has long been rumoured to hide secrets of the Knights Templar. It was founded by William Sinclair, 1st Earl of Caithness, 3rd Earl of Orkney, and grandson to Henry Sinclair, in 1456, and took over forty years to complete. Master stonemasons carved elaborate and complex symbolic details into the chapel's entire structure - details that would link it to Henry Sinclair's trans-Atlantic expedition and even to the legendary Holy Grail. 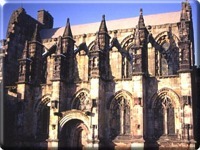 The historical connections between the Sinclairs, the Crusades, and the Masonic symbolism built into Rosslyn Chapel provided fodder for legends revolving around the Holy Grail and the Knights Templar. Some legends of modern invention assert that the Templars sent the Grail to Scotland for safe-keeping when the Order was formally disbanded in the early 1300s, knowing that Robert the Bruce would be slow to enforce the Papal Edict ordering the closure of Templar monasteries. 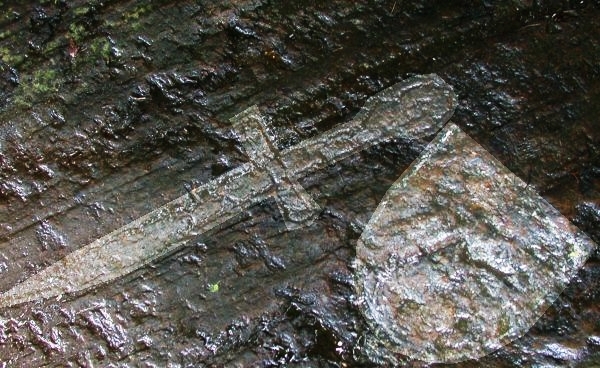 Other traditions maintain that the Templars took the Holy Grail to northern Spain, protecting it there until the surviving members of Sir James Douglas's party brought it back to Scotland. When popular associations with the Knights Templar began to merge with Freemasonry, Rosslyn Chapel provided the perfect backdrop for legend. According to one tradition, William Sinclair, 1st Earl of Caithness, founded Freemasonry to protect the secrets of the Knights Templar, guardians of the Holy Grail, after the Order was disbanded. 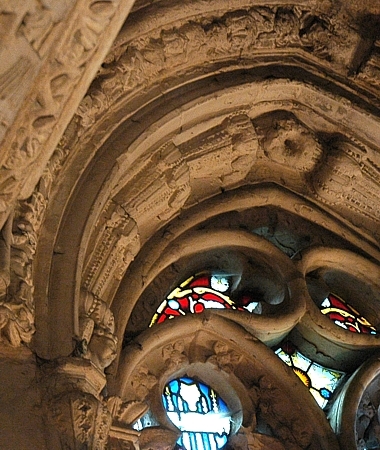 He began construction of Rosslyn Chapel to safeguard the Templar's legacy, while other Masons incorporated their secret symbols and puzzles into the Chapel's physical details. Burial vaults below the chapel are known to contain the remains of ten Barons of Roslin in full armour - and are rumoured to hide the Holy Grail itself. Another Masonic connection: an 18.6" x 5.6" scroll, made of three pieces of linen or sailcloth, hangs in Lodge Kirkwall Kilwinning No. 38(2) in Orkney. The centre strip of cloth displays one hundred Masonic symbols, while the outer two panels display world maps. This scroll was gifted to the lodge by one William Graham, a painter, in 1796, for use as a ceremonial floor-cloth. The outside world paid little attention to it until 2000, when Andrew Sinclair, a writer and pseudo-historian, brought it to the Oxford University's Accelerator Laboratory for carbon-dating. Two tests yielded wildly differing results, suggesting that the scroll could be as old as six hundred years or as recent as the eighteenth century. 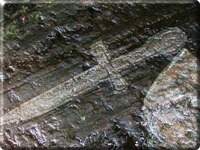 Sinclair seized the intriguing possibilities of pseudo-history and claimed that the Kirkwall Scroll was an ancient relic of Freemasonry filled with Templar images that linked it to the Sinclair family and Rosslyn Chapel. The word "sultcrinea" in the third panel, he concluded, was an anagram of "St. Cler" and "Vina," a nod to Henry St. Clair's fourteenth century voyage to the Americas (vina being an abbreviation for Vinland, the Viking name for Newfoundland). Further evidence that Henry St. Clair had indeed gone across the Atlantic might be found in the chapel itself. Among the beautifully detailed carvings are depictions of distinctly North American plants such as corn and aloe - but how could the artists have known what such things were?